Throughout New York City, ghost subway stations serve as a reminder of the past. We spy fleeting glimpses of 91st St. underneath Broadway between 86th and 96th, and eagle-eyed riders of the 6 train know where to look to see the forgotten columns of the 18th Street station. Bill Brand’s Masstransiscope is a vivid reminder of the Myrtle Ave. subway station, but the MTA won’t even officially acknowledge the existence of the South 4th St. shell above the G train’s Broadway stop. Even as the allure of the past draws us to these abandoned or never-used subway stations, over the years, various groups have proposed more practical uses. 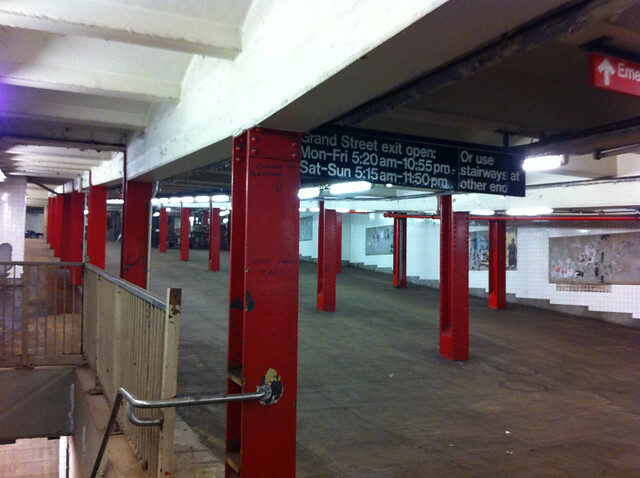 The old Court St. subway station in Brooklyn, for instance, hosts the Transit Museum, and on-again, off-again efforts to turn City Hall into a Transit Museum annex died at the hands of security concerns even before the 9/11 attacks. Today, it is home to regular Transit Museum tours and serves as an attraction for those who ride the 6 train through the loop south of the current Brooklyn Bridge station. Every now and then, some plans emerge to make use of abandon subway stops, and those plans generally consist of fanciful renderings that go nowhere. We can talk about underground theater space and art galleries or restaurants, but throughout the world, abandoned subway stations continue to be just that. They remain forever abandoned. NKM has explained her thinking on the proposals. For those of you, like me, who cannot read French, she has said she wants to convert seven of the 11 Paris Metro ghost stations into community spots. She herself went exploring two decades ago because “it was too tempting,” and she notes that “magical” atmosphere underground. I understand her sentiments entirely. It’s hard not to find these ideas appealing even if the odds of them becoming a reality are slim. We dream of past station we never saw in service, and we dream of ways to bring back what was once built for productive uses. The City Hall station in New York remains something amazing to see while others flash by in the blink of an eye. Maybe one day, the public can appreciate abandoned infrastructure; today, we’ll just enjoy these renderings instead. I’ve been a long-time fan of Bill Brand’s Masstransiscope. It’s one of Arts for Transit’s more intriguing installations as it is a zoetrope in an abandoned subway station. Visible from the Manhattan-bound B and Q trains just north of De Kalb Ave., the art installation shows a series of moving images as the train passes by. Originally installed in the early 1980s, it was meticulously restored in 2009, but graffiti artists attacked. By mid-2013, it was again dark. Now, thanks to a recent article in The Wall Street Journal we know why. Over the weekend, Ted Mann unveiled his tale of the restoration of the Masstransiscope. Apparently, vandals had taken advantage of the Superstorm Sandy shutdown to wreck havoc on Brand’s art. After the storm, Arts for Transit workers found that some of the 57 metal panels had been torn down while portions of the 228 still images had been tagged. Over the past year, the art has been meticulously restored, and last Wednesday, the Masstransiscope for again visible to Q and B train riders, many of whom are surprised by the moving images. While I’ve burned a lot of pixels on the QueensWay recently, the city’s other rails-to-park project is slowly inching forward. The LowLine, an ambitious plan to bring natural light underground in order to turn the Essex St. Trolley Terminal into a park, has garnered a lot of attention as a creative idea. Not surprisingly, I’ve been very skeptical about a plan that involves during unused transit infrastructure into a green space, but the organizers have assured me that there is no real transit use for it in 2013. Lately, in between fundraisers and Kickstarters, the LowLine has developed a following of politicos. Last month, Manhattan representatives urged the EDC and MTA to work out a transfer of the space. The letter claimed that the Delancey Underground park “could generate at least $15-$30 million in economic benefit to the city by way of increased sales, hotel and real estate taxes and incremental land value,” and a Who’s Who of New York politicians, including our two senators, members of Congress, Manhattan Borough President Scott Stringer, Assembly Speaker Sheldon Silver, State Senator Dan Squadron and Council Members Rosie Mendez and Margaret Chin, all appended their names to the effort. And yet, the money needed is very problematic. While the founders have been able to fundraise minimal amounts to put together prototypes and other exhibits, Kim Velsey in The Observer highlighted the considerable obstacles that remain. Construction could cost anywhere from $42-$70 million, and annual maintenance would run around $2.4-$4 million. Even the most popular parks in New York can’t cover their expenses from concession revenues. The park proposal has had more staying power than I ever imagined it would, but I still grow uneasy about turning over transit infrastructure to anything other than transit. It’s exceedingly difficult to find money and the will to build new transit spaces in New York City. Reserving pre-existing ones for future uses should be a priority. The LowLine is a creatively futuristic idea, but can it ever be anything more than that? The Williamsburg Bridge Trolley terminal as seen in its younger and more vulnerable years. The Low Line — the ambitious and futuristic plan to send sunlight into an underground trolley terminal while turning the space into a park — is the project that just won’t die. For the better part of three years, we’ve heard about the efforts to convince the city to support this project at the expense of transit space. The Wall Street Journal in particular seems to be in the pocket of the Low Line’s proponents, and the paper has run yet another glowing article about the park plan with nary a nod to potential transit uses for the old Williamsburg Bridge Trolley Terminal. Ramsey and Barasch’s vision of the Lowline has become anything but fiction. There’s been a Kickstarter campaign backed by 3,000 supporters. The $150,000 they raised online financed a full-scale model, with working remote skylights and parabolic dishes, which the duo and their dedicated team exhibited for a month…There’s been legal vetting; a budget and a business plan; and endorsements from community board #3, the City Council, the State Assembly and the New York State Senate. What they most need now—apart from the $55 million it will take to build—is for the MTA to let them have the space. It may take another 5 years, or 10, but the Lowline, with its even spread of political, financial and community support, is poised to become the New Yorkiest thing to happen to New York City since the Double-Dutch tournament at the Apollo Theatre. This isn’t the first time we’ve heard such an over-the-top adulation of the Low Line from The Journal. Earlier this year, in the Real Estate, Journal writers spoke of enhanced property values the park could bring, again ignoring any potential transit uses. The Journal has decided the Low Line shall exist, and exist it shall. But those hurdles Hamilton mentions aren’t insignificant. She speaks of $55 million as though it’s a drop in the bucket, but it is exactly the opposite. Barasch and Ramsey won’t be able to fund that total through Kickstarter, and if we cast a glance across town, even the High Line raised only $44 million from donors for its first two sections. Will the city fork over the dough for the Low Line? Should it? Meanwhile, getting the MTA on board won’t be easy either. There is no real reason for the agency to give up on valuable transit space. True, it has sat unused for longer than it was in use, but as Cap’n Transit explored last year, it could and should be in use again. Until we know for sure there are no transit uses for the space and until the MTA is adequately compensated for the terminal, it will remain in this limbo of past ghosts and future promises. A few years ago, the Low Line had the ears of some higher-ups at the MTA, but those higher-ups have long since moved on and out. The Low Line gets press because it’s a unique idea, but ultimately, we don’t even know if it’s a sustainable or realistic idea. The MTA would have to go through an RFP process for the space, and build-out and maintenance costs won’t decrease. It’s not going to be five years or ten, as Hamilton imagines, and it probably shouldn’t be ever. 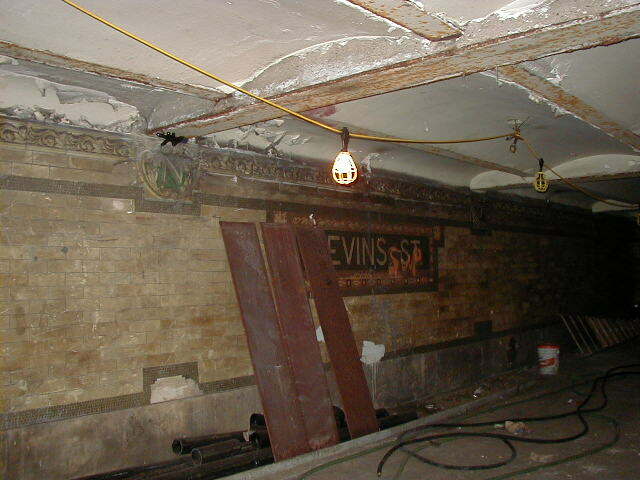 A glimpse of history underneath Nevins St. When the MTA recommissioned the old South Ferry loop last week, New York saw a subway station once closed for good returned to service. In the history of the city’s subways, this is a rare occurrence with only a few stations once lost to time returned to service. Throughout the city, the abandoned or half-built and never-completed stations flash by like ghosts from another era. Stare hard enough into the dark and stations at 91st St. and Broadway or 18th St. and Park Ave. South materialize out of the tunnels. Elsewhere, parts of a system never realized remain hidden from view, poking their heads out now and then before receding into the shadows of history. The South 4th Street station shell above the northern end of Broadway on the G’s IND Crosstown line had its moment in the sun two and a half years ago when street artists turned it into their Underbelly canvas. That shell is part of a series of provisions for IND Second System lines at various stations throughout the city, and while the hints exist for those who know where to look, they’re largely out of sight and out of mind. At another station in Brooklyn, an intriguing abandoned/never-used platform exists underneath Nevins St. and runs for some distance nearly to the Pacific St. platform along 4th Ave. at the current Atlantic Ave./Barclays Center station. Unlike the South 4th St. shell, this one has wall tiling and completed tunnels, and various nearby stations — DeKalb Ave., in particular — were constructed with its usage in mind. Today, it exists off of the Nevins St. underpass and remains forever unused, a remnant of a time when the city planned ahead even it wasn’t quite sure of where those plans might lead. Various explorers, sanctioned and not, have ventured into the Nevins St. area. Before a rehab of the upper levels, the lower level was visible from the cross-under, but the existing platform areas have since been sealed off. Still, the photos available show finished tile and mosaic work and track beds. LTV Squad has a series of photos showing the extended tunneling and water damage to the current area. 3 West of Nevins St: Lower level trackway under main tracks to north edge of construction, and upper level removable wall. For two tracks off a Manhattan Bridge route. The BMT De Kalb Ave station was built as if this had still not been ruled out: its main track level is at the level of the IRT lower level, for the outbound track connection, and its upper mezzanine level has no structure blocking the path of a track off the IRT main level. 4 East of Nevins St: Lower level trackway under main tracks to east edge of construction, and upper level trace of provision for an opening in the side wall. For a Lafayette Ave subway. Such a subway was actually built for the IND system later. 5 West end of Atlantic Ave station: Upper level outbound local curve south into 4 Ave, and lower level crossing under main tracks to a ramp up to main level inbound local. Both are now obscured. The upper level curve is still visible in the wall of the Atlantic Ave station side platform, as extended northward in 1964. The lower level is hidden, and the ramp up is covered by the present westbound local track (2 3 trains) built 1962-1963. Today, history sits beneath our feet at Nevins St., invisible to nearly everyone as thousands of passengers pass through the station each day. I’m always struck by the planning — or the over-planning — of the original builders of the subway. These days, we pare back our subway expansion plans from two stations to one, from four tracks to two. But a hundred years ago, construction was halted for six months to build provisioning never actually put into place. These days, the BMT uses the connection over the Manhattan Bridge via DeKalb, and of course, it extends to Atlantic Ave. and beyond via tunnels that mirror the Nevins St. plans. That routing though swings north of and around the Nevins St. station. The IND, via the G, utilizes the Lafayette Ave. route and cuts through part of the tunnels constructed around Nevins St. Subway planners built the lower level at Nevins St. for a purpose, and though that purpose came to pass, trains forever bypass the station. All that remains is an intriguing abandoned station out of sight and out of mind. Long-time SAS readers know that I have a bit of a love affair with the New York City subway system’s abandoned nooks and crannies. I’m fascinated by the shuttered stations and the never-used shells. I’m impressed with the foresight of planners who built provisions for unfunded future expansion. I’m enthralled by the maps of the Second System, a dream unfulfilled that would have changed the city forever. Every day, millions of New Yorkers commute through a subway system that has largely been static for decades. Although the Queens Boulevard connection opened a little over a decade ago and the Archer Ave. stations debuted back in 1988, the system has been largely as it is today since the mid-1930s. Yet, behind the facade of the subway map lies a handful of secrets. An abandoned station at 91st St. and Broadway flits past riders on the 1 train, and a redundant and closed platform at 18th St. and Park Ave. South can be seen from the downtown 6 train. Atop Broadway in South Williamsburg, a shell of a station never finished is host to both lost dreams and the Underbelly Art project. Near the Manhattan Bridge, a shuttered station plays host to the Masstransiscope. We ride largely oblivious to these relics of another era and other plans. Maybe we know that the Second Ave. Subway has been a long time coming, but most don’t know that it was once designed to connect into the Bronx and Brooklyn. 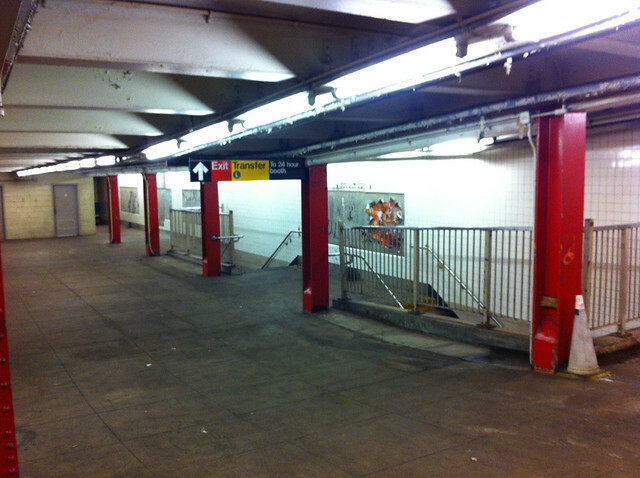 Yesterday, Jim O’Grady went inside the city’s lost subway stations and expansion plans. The team at WNYC produced an interactive map, and I’ve embedded the audio below. It’s a fascinating glimpse into the history of almosts under the streets of New York. Today, we can’t even gather the political will or money to build anything more than the barest of provisioning for a future station at 41st St. and 10th Ave. We can’t realize more than a few stations along Second Ave. We can’t envision a subway system stretching further out into or better connecting Queens and Brooklyn or one that better crosses the Bronx. Instead of living in the minds of planners, these dreams live only in fantasy maps found on various message boards throughout the Internet. Costs, of course, are an issue. The increased construction costs coupled with the Great Depression and then later World War II and the rise of the automobile torpedoed the Second System plans before they could get off the ground. Today, we hear tell of inefficient capital building brought about by arduous work rules and NIMBY opposition. We are content with what we have when all around us are reminders of a past that could have been. Dream big, I say, because that’s how New York and its subway system became great in the first place. It’s fascinating to hear of South Fourth Street, but it would be even better to see a city with a line that passes through that station on its way east. As creative urban parks go, New York City’s High Line is a great success story. The city, with fiscal help from private donations, turned an abandoned and decrepit freight rail line that no longer went anywhere or connected to the rest of area’s transportation network into a popular park that weaves through a neighborhood teeming with residents, businesses and tourists. Now, everyone wants a piece of the action. Across the country, urban activists are eying the nation’s dying rail infrastructure not for transit but for parks. In Chicago and Philadelphia and Detroit, community groups are searching for the “next” High Line — some infrastructure that can be turned into a park that will revitalize a neighborhood. It’s not quite that easy as New York’s High Line runs through a densely-populated neighborhood that already was a big tourist destination before the park opened, but that minor point isn’t stopping anyone. Even within the city, New Yorkers are also looking for the next spot for the new High Line. Every few months, the Delancey Underground effort earns some press, and now an old initiative from Queens is gaining ink as well. On Friday, the Daily News explored how Queens residents are once again trying to turn the LIRR’s defunct Rockaway Beach Branch into a park. This isn’t a new plan; it last garnered coverage back in 2005. But with the High Line’s success, residents are emboldened to try again. Encouraged by the success of the High Line in Manhattan, a group of Queens park advocates are rebooting a proposal to rehabilitate an abandoned rail line into a greenway. The old Rockaway Beach Branch of the Long Island Rail Road, which went out of service almost 50 years ago, stretches from Rego Park to Ozone Park, cutting a swath through Forest Park. Crawford was part of a group of civic leaders who met with city agency representatives this week to discuss preliminary plans for a greenway along the route. Remnants of the line are visible throughout the area. The tracks ran along trestles above Metropolitan Ave. and Union Turnpike. The path is mostly clogged with trees and overgrown vegetation, but it still includes some train tracks and signal equipment and towers. The tracks, which lead into Forest Park just south of Union Turnpike and Woodhaven Blvd., are owned by the city. As Colangelo explained, Community Board 9 supported the idea a few years ago, but Community Board 6 declined to authorize a feasibility study for a park. Residents in Forest Hills had raised concerns focused on “security and the impact on private property.” Today’s activists aren’t going to let obstacles from a few years ago hinder them. Now, outside of the practicality of it — what money will turn this abandoned rail line into a park and is it in a part of the city to which people will travel to experience such a transformation? — there’s another issue: It’s part of a long-term effort that removes transit infrastructure from its intended use. By turning the West Side Line into the High Line, the city ensured that it would never be used for rail transportation again. If the Essex St. trolley terminal suffers the same fate, it too will never be a part of the city’s transit infrastructure. The Rockaway Beach Branch has been fetishized by transit advocates for decades. The MTA once considered using the line as part of a one-seat ride to JFK or for Airtrain right-of-way before NIMBYs in Queens killed that idea, and an extensive thread on a popular transit message board traces the various ideas for reactivating the rail line. In his 40-year plan for the MTA, then-agency head Lee Sander mentioned restoring transit services to the line as well. Turning it into a park would immediately dash any of those hopes. Therein lies the tension with old infrastructure: How long should a former train route lie fallow before we can accept other uses for it? Should the city be willing to discard half-formed plans to activate train lines that could provide useful service because someone else is louder or better connected? Turning the Rockaway Beach Branch into a rail trail will forever preclude using it for transit just as turning the Essex St. Terminal into a park or shopping area would do the same. That’s a decision that should not be made lightly. A few months ago, as Jay Walder’s tenure at the MTA came to an end, word leaked out of an ambitious plan to turn some idle underground infrastructure owned by the MTA into a park. Called “Delancey Underground,” the plan involved bringing sunlight from above through fiber optic cables to create a park in the abandoned Essex St. Trolley Terminal. As New York City has seen the High Line take off on the West Side, the park proponents envision something similar for the Lower East Side. For Transit, converting these idle spaces into something useful is part of a new focus on “creative redevelopment and reuse.” If the authority can make money while turning parts of the system into spaces for urban creativity and exploration, even better. Still, the trolley terminal hasn’t been in use for sixty years. It could be a few more before anything lands there. For now, it’s still just a glimpse into the city’s transit past.